We've woken up to a BEAUTIFUL day in Needham Market today! The sun is shining, the birds are singing, and I've got some washing on the line. That always makes me so happy! It's the little things, right? Pretty soon the bees will be flying! If we have good weather they could come out this month. I love Bumblebees, they're beautiful creatures - you can find out more and give them a helping hand over at the Bumblebee Conservation Trust. Today's project features a Bumblebee - isn't he gorgeous? 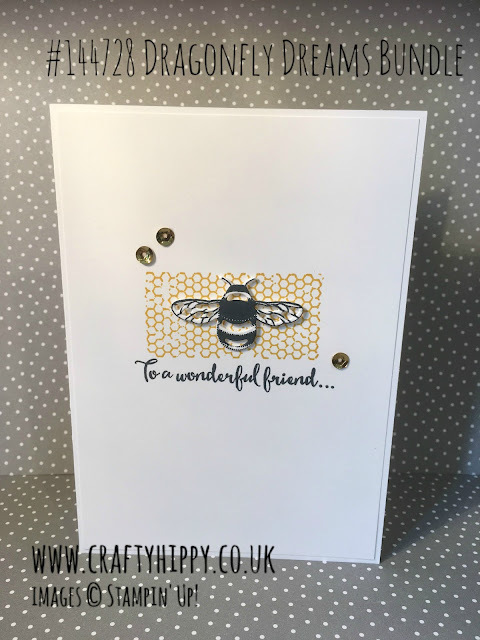 The bee was stamped using the Dragonfly Dreams stamp set and cut out using the Detailed Dragonfly Thinlits Dies in the Big Shot Machine. You can actually purchase the first two items together as the Dragonfly Dreams Bundle, saving you 10%. I used the Butterfly Basics stamp set for the honeycomb pattern - please note that there is also a Wood Mount and Clear Mount option. I used Crushed Curry as it is a gorgeous rich yellow. The project was finished off using some Metallics Sequins Assortment - I picked out three of the gold round sequins. I'll be back tomorrow with another Stampin' Up! project. Enjoy the sun!